Hawaii Athletic Trainer’s Association President Louise Inafuku used the Automated External Defibrillator (AED) to help save three lives in the past two years. 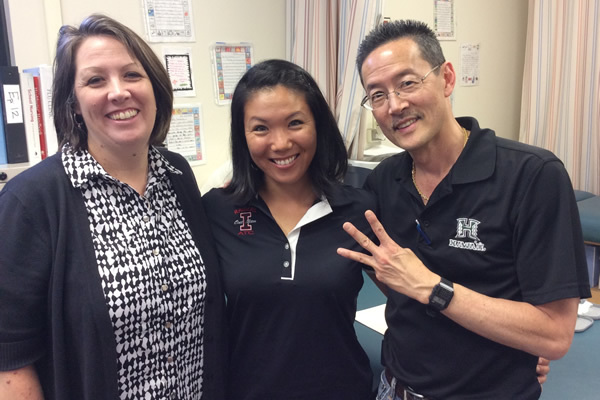 In May 2012, she assisted Director of Health Services of Iolani School, Shannon Yonamine, with a faculty member who collapsed in the infirmary. He was shocked once with the AED before EMS arrived. He underwent surgery, received a pacemaker and is back to teaching. In October 2012, she assisted a parent of a visiting team who collapsed while spectating a water polo game. One shock was delivered with the AED before EMS arrived. In February 2014, a baseball coach collapsed on the field. She delivered one shock with the AED and performed two minutes of CPR before the Fire Department and EMS arrived. He underwent surgery to receive a stent and is back to coaching baseball once again. Louise is grateful to be part of a profession that prepares her to stay calm in stressful situations in order to help save lives. Hawaii is also home of Dr. Alson Inaba of John A. Burns School of Medicine, who created the life-saving “Staying Alive” CPR technique.